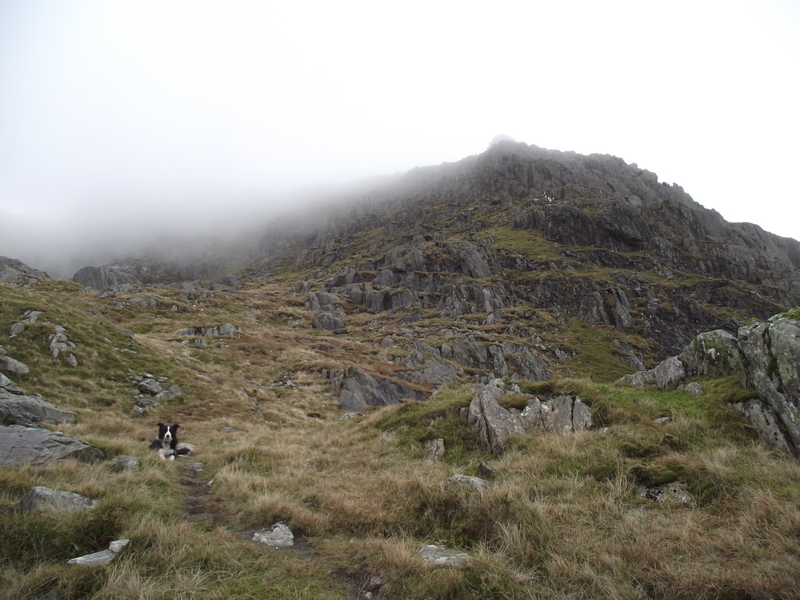 #145 – More wanderings in the Glyderau – Seniors Ridge with the dog. The great thing about living in or near a mountain area is that you get to know it well. 25 years living in Cumbria left me with loads of good memories and a good knowledge of the Lake District – I could still cross the Lakes National Park without a map, and find my way round most of the north and east in poor visibility by following known landmarks. I’m currently ticking off the important bits of Snowdonia, which is about an hours drive away from where I now live. 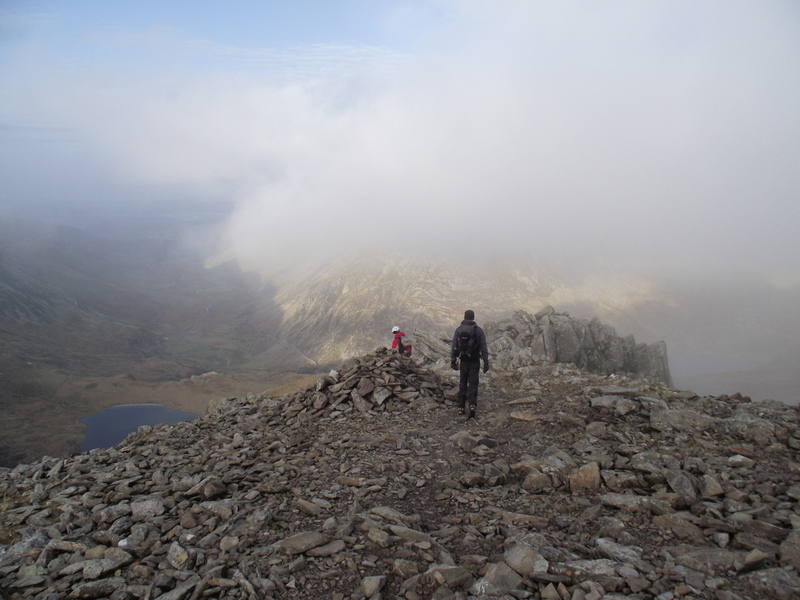 Over the past 1½ years of living in North Wales, I’ve completed a ‘tick list’ of peaks, but what next when the peaks have been done? Start filling in the gaps, that’s what, so a misty Saturday found me in the Ogwen Valley, heading for the hanging valley of Cwm Cneifion. 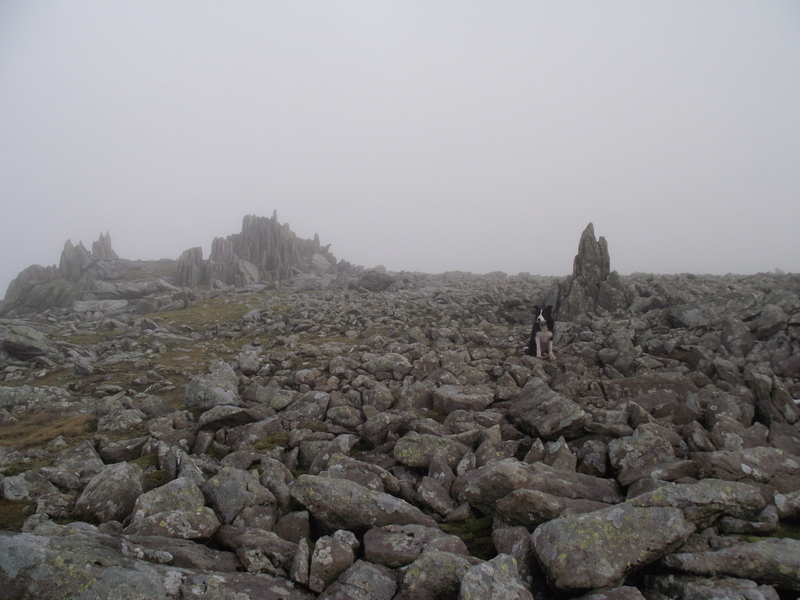 I had Border Collie ‘Mist’ with me, and ‘Seniors Ridge’ looked like being a fun day out for the dog. 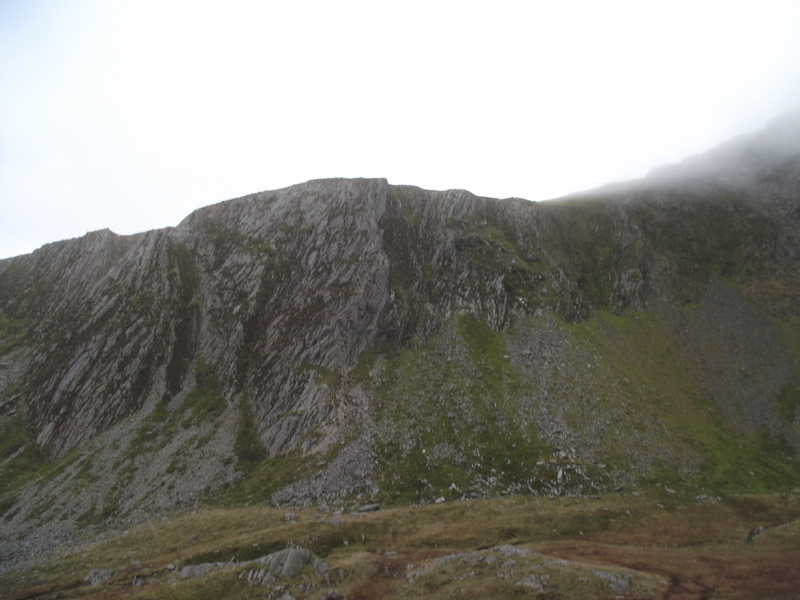 It has to be said though, ‘Seniors Ridge’ doesn’t look much from below – what DID look really interesting was ‘Cneifion Arête’ on the opposite side of the cwm. I knew of ‘Cneifion Arête ’, but had never climbed it – it’s one of those routes that straddles the line between hard scrambling and easy rock climbing, and looking across to the route I was already making a mental note to return. However, today was a dog day, and ‘Seniors Ridge’ was on the menu. 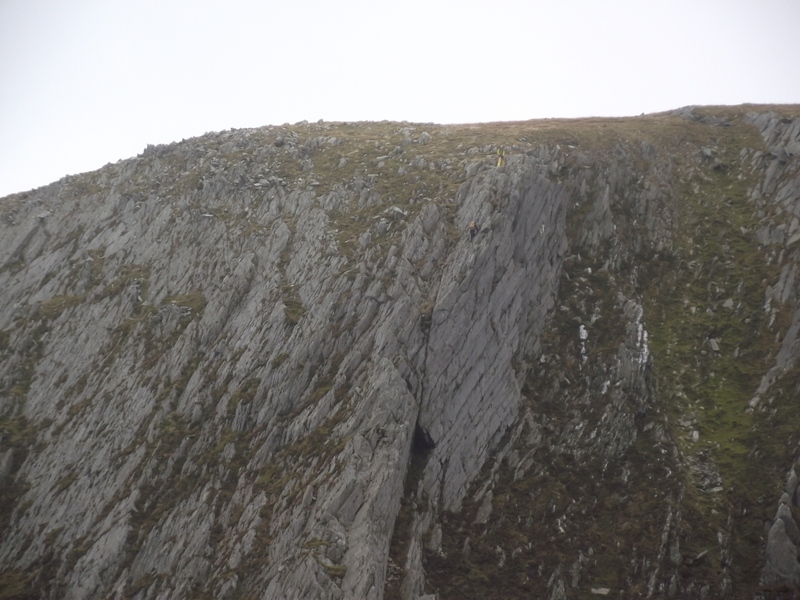 ‘Seniors Ridge’ is a much easier option than the ‘Cneifion Arête’, lacking the knife edge drama of the latter. ‘Seniors’ is a wide, whaleback ridge, with an easy path most of the way up. I should add that ‘easy path’ is relative, and although this was a dog day it’s perhaps not the route for a pampered pooch – Border Collies, on the other hand, get bored waiting for their human to catch up. Still impatient, still waiting …..
A path of sorts weaves through steep rock, with just the occasional step needing hands as well as feet. I hadn’t brought the dog’s harness as I wasn’t expecting any ‘epics’, and sure enough ‘Mist’ just bounded up each steep bit without any difficulty. 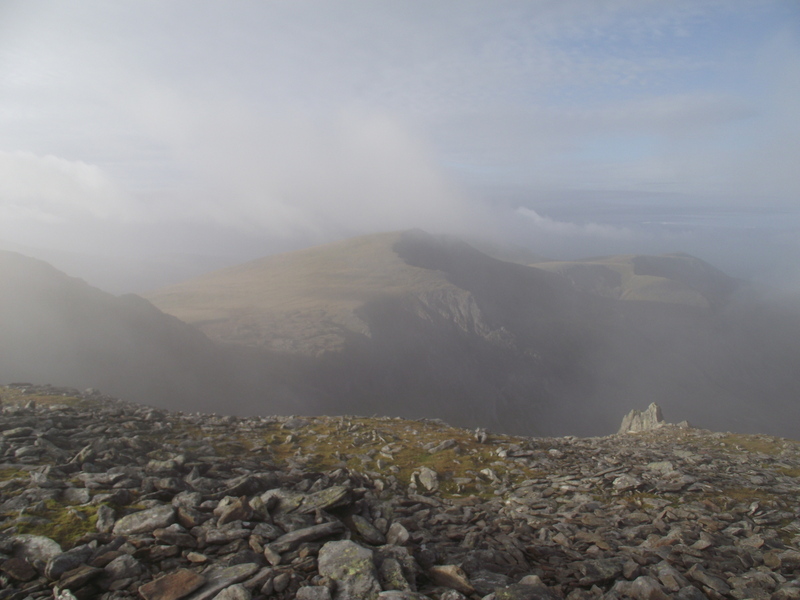 As we got higher, the mist got lower, and as I reached the summit Plateau of Glyder Fawr I wasn’t expecting any views, nor did I get any! A confusion of cairns …. 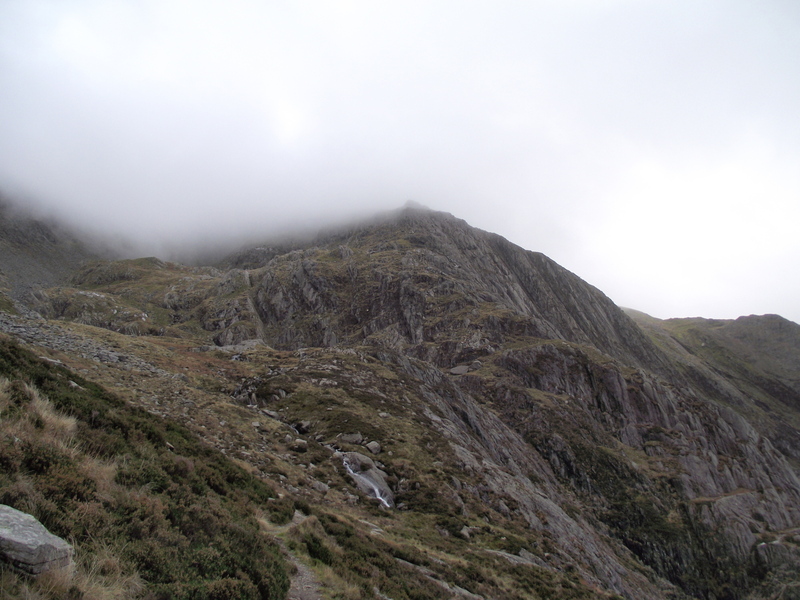 Y Garn in the mist …. 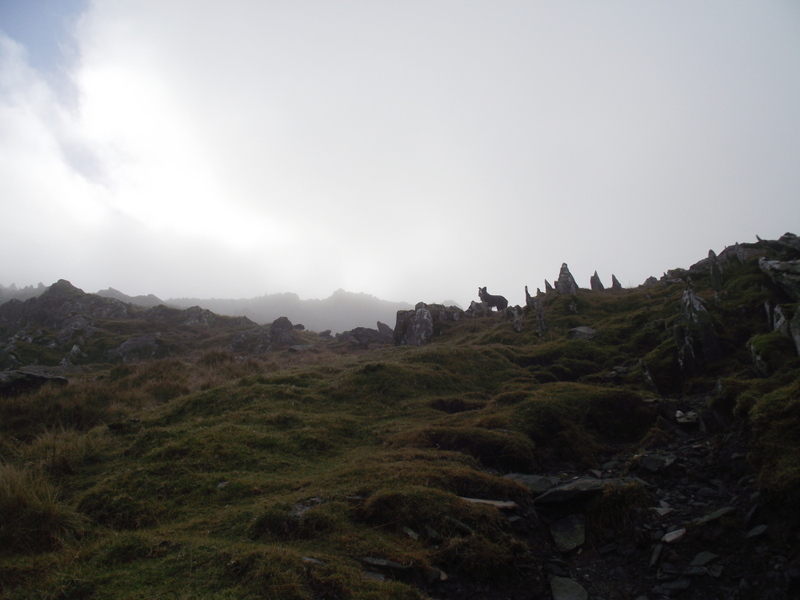 In mist, the summit plateau is a mysterious, ethereal ‘other world’, with weird rock spikes and outcrops all over the place. It’s also an awkward place to navigate for those who don’t know it, and a confusion of unnecessary cairns doesn’t help, but an easy to follow path cuts along the top of the headwall of Cwm Cneifion. 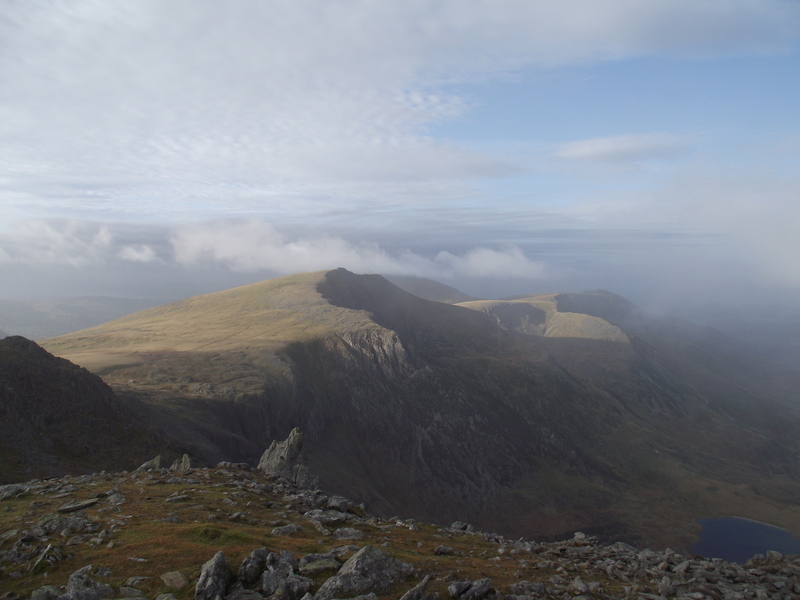 As I headed round to the top of the Y Gribin ridge, the mist cleared a bit, giving views towards Y Garn. 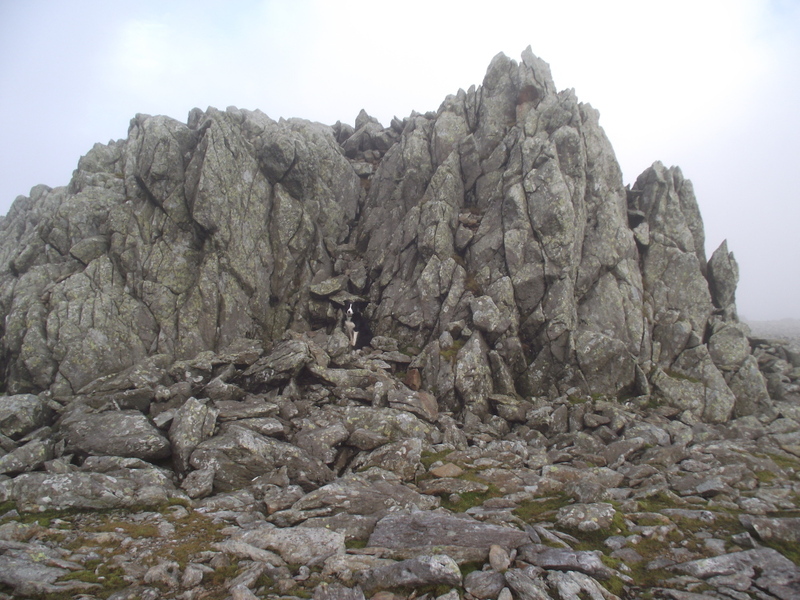 My intention was to ‘have a look’ at the descent of the Y Gribin Ridge to see if it was OK for the dog. 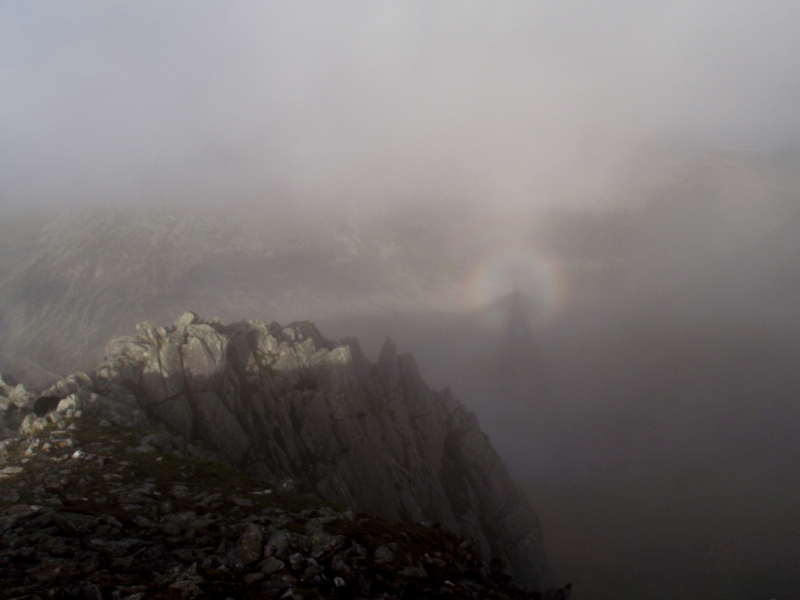 Then I saw it – a ‘Brocken spectre’! This phenomenon is nothing more than your own shadow projected onto mist, but I had never seen one in forty years of knocking about in the hills. I managed to grab a poor photograph before the spectre disappeared. 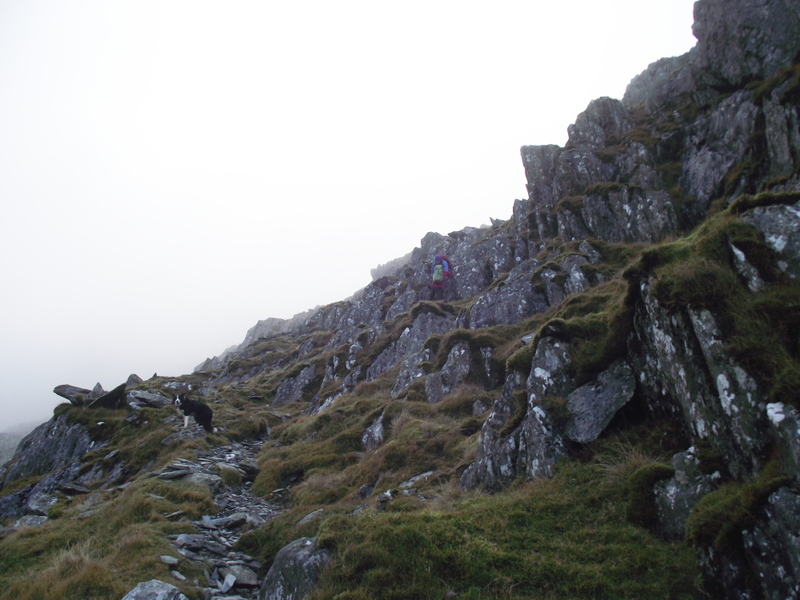 Our route downwards also disappeared, into a series of steep rock walls that I had to down-climb then assist the dog over – I can tell when ‘Mist’ has reached her limit of confidence and ability when she stops and waits for help. 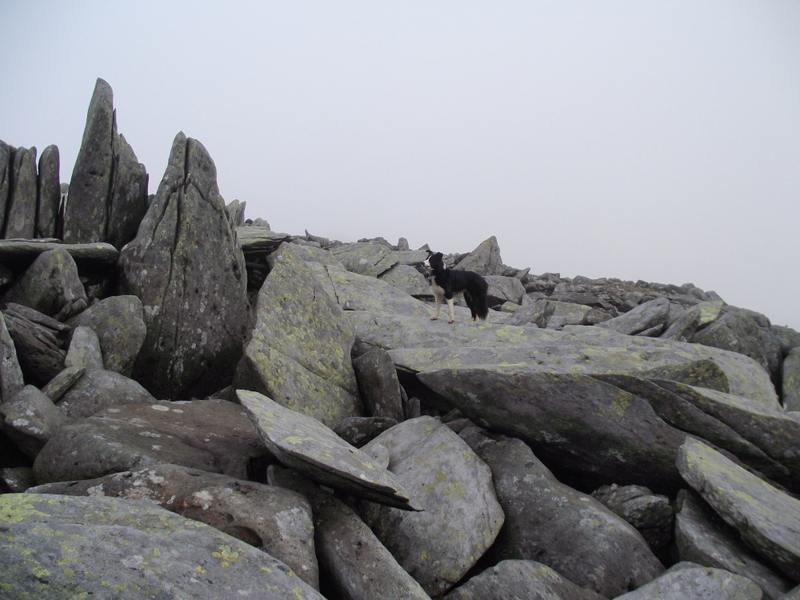 I decided that it was steep enough to make an accident a possibility, so kicking myself for not bringing the dog’s safety harness, we set back upwards to join the path for Glyder Fach and its famous ‘Cantilever Stone’. 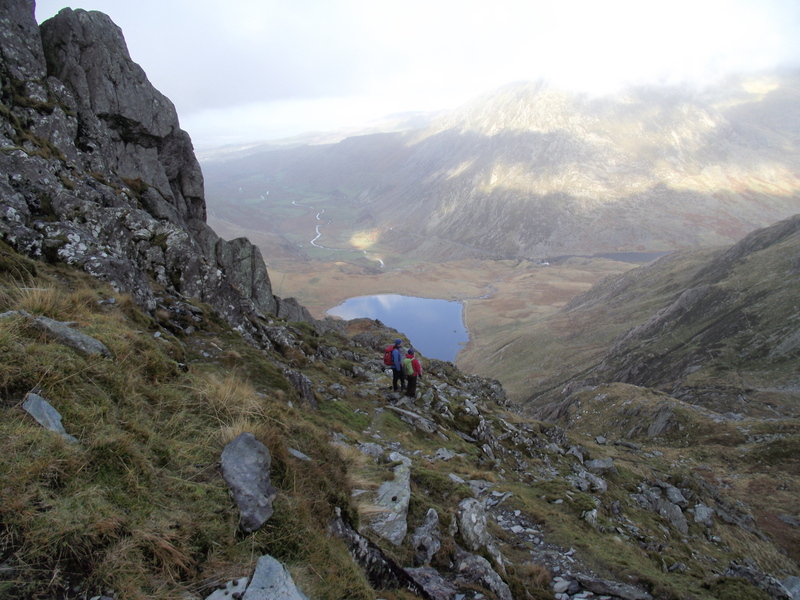 Looking back up our descent route alongside ‘Bristly Ridge’ …. 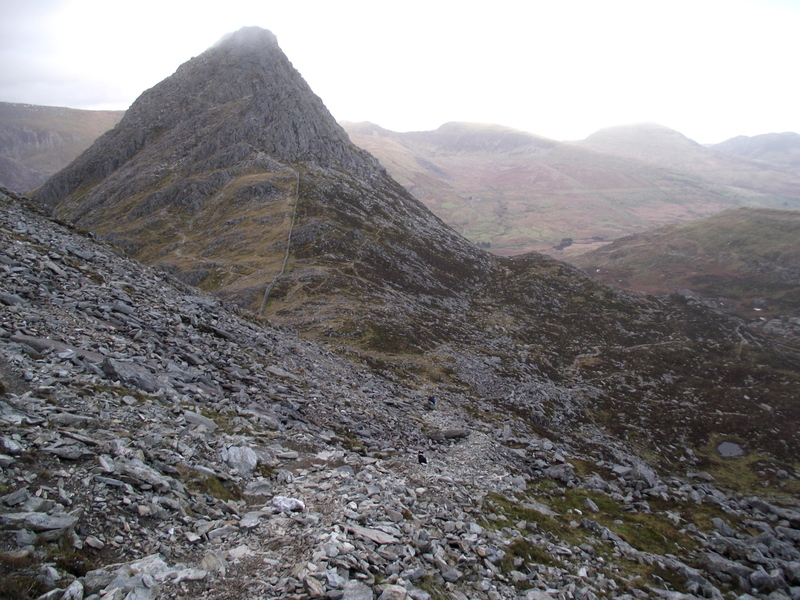 From there I opted for the easy option of the scree path next to Bristly Ridge – this is loose and steep, but gets straight to where you want to be, that being the pass of Bwlch Tryfan in my case. 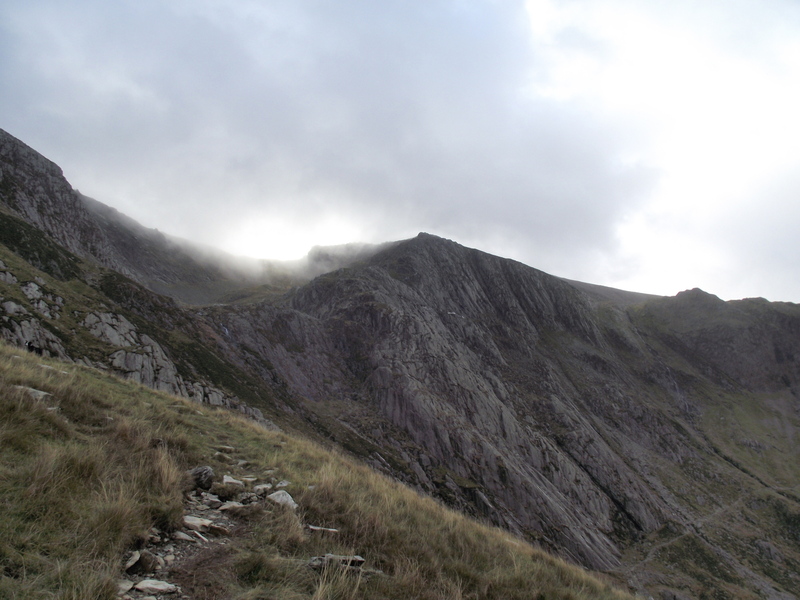 From there a steady walk pointed us back towards Ogwen. My perfect end to a hill day is to come down in the dark, and the light was just starting to fail over the last kilometre, but I was a bit too early – oh well, maybe next time. p.s. 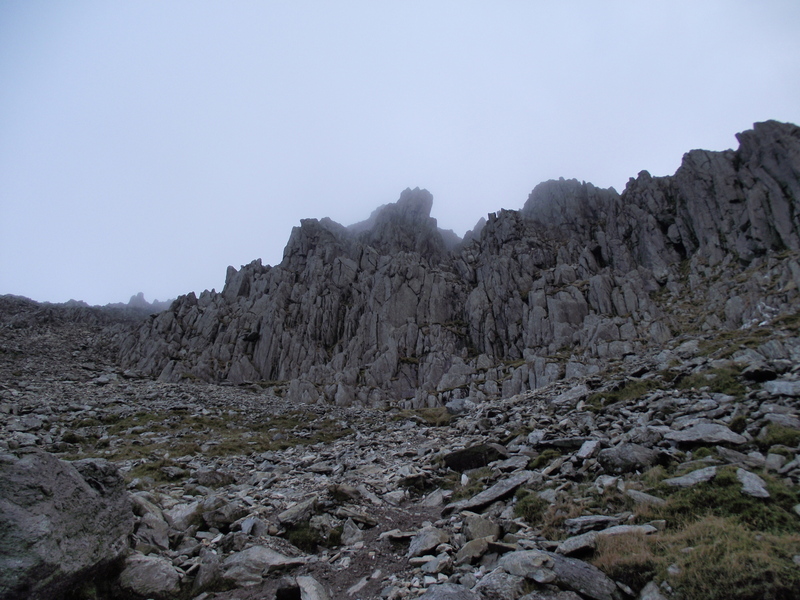 ‘Cneifion Arête ’ is a Grade 3 scramble/Moderate rock climb. ‘Seniors Ridge’ is a Grade 1 Scramble, but low in the grade if you follow the route I took, and ‘Y Gribin’ is also a Grade 1 scramble. Remember that un-roped scrambling can be dangerous, especially for those lacking experience. This entry was posted in 5. 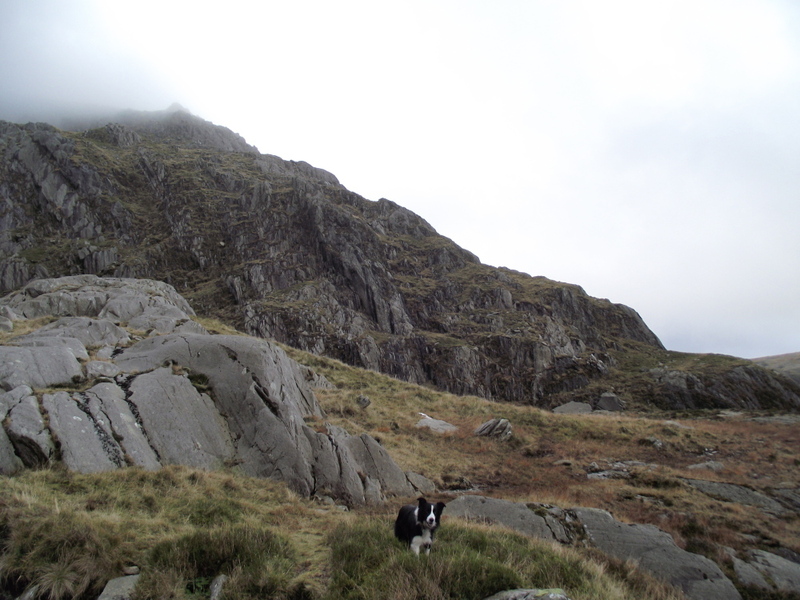 North Wales and tagged Border Collie, Cwm Idwal, Glyderau, hillwalking, mountaineering, mountains, photography, Snowdonia. Bookmark the permalink. 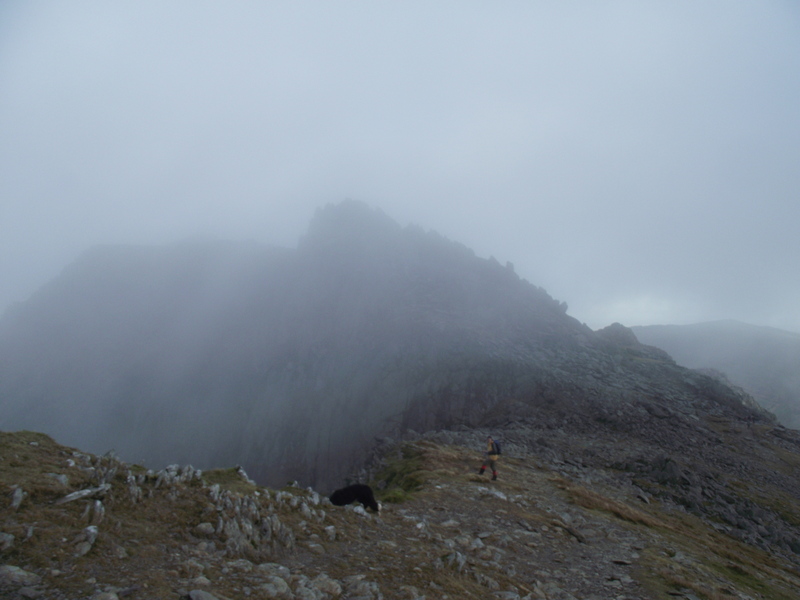 25 Responses to #145 – More wanderings in the Glyderau – Seniors Ridge with the dog. Amazing photos of a strange and eerie place! Thanks Connie – it is an amazing place, especially in the mist. Wow! Many of your photos look like you’re on the moon. The brocken spectre effect is pretty darn cool 😀I was examining the photo before I read what it was… My little pampered pooches would most likely look at me and say, “Mom, what are these large hills?” Remember I’m a prairie flatlander. Thanks for sharing your side of the world! Amazing photos! And an amazing dog! Thanks for visiting my blog Winma, and thanks for the kind words. Ah, so that’s what a Brocken Spectre looks like. I’ve read about them (in the context of one seen from the summit of Ben Nevis inspring the invention of the cloud chamber particle detector), but I’ve never seen one. The Brocken Spectre was amazing Lance! I’ve been going to the mountains for forty years and never seen one before. The really weird thing was that when I moved my arms, the spectre did the same – I knew that it had to, because it was my shadow, but it still looked weird! The Cantilever Stone is a hoot as well – I’ve seen a photo of a dozen blokes jumping up and down on the end, but it’s absolutely solid. This photo isn’t the best in my collection, but it echoed the mood and weather of the day. Hi Paul. I have read that there has been alien sightings in the Berwyns a bit further south and wonder if it isn’t just Brocken Spectre’s .Must be cool to see one! Haha … Strange things happen in the Welsh Hills Mark. 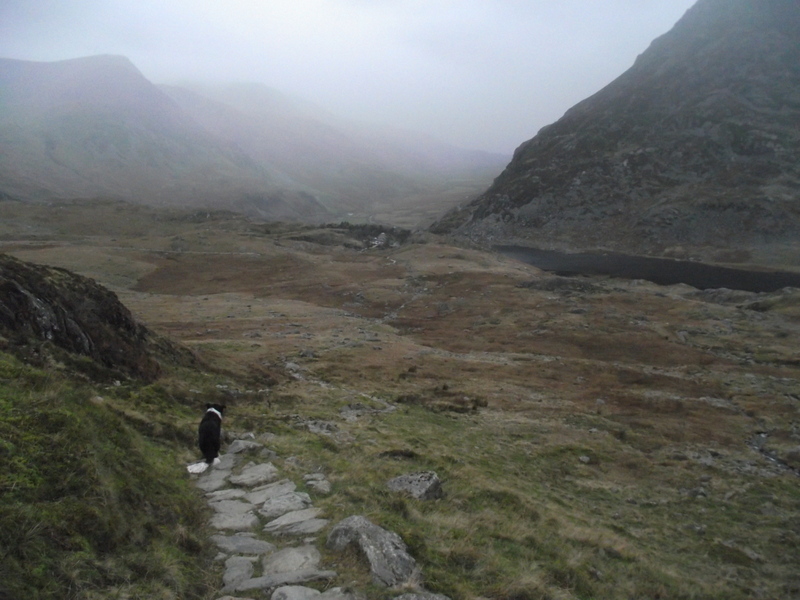 Geoff once took his Border Collie over Bristly Ridge and ended up having to ‘make’ a harness for her part way across, out of a sling he happened to have in his rucsac! I don’t think it was on her list of favourite days out………. 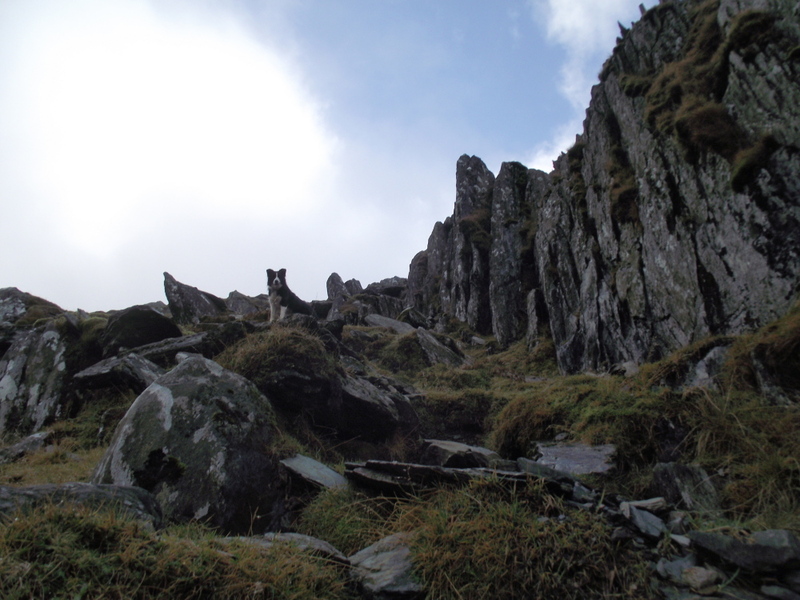 It’s strange, but I’m much more protective of ‘Mist’ than I was of my last search dog ‘Matt’ – He came with me on routes like the Aonach Eagach, and I never thought twice about it. I would probably spend half the day worrying about ‘Mist’ – quite unnecessary as she’s very agile and knows when to wait for me to help her. 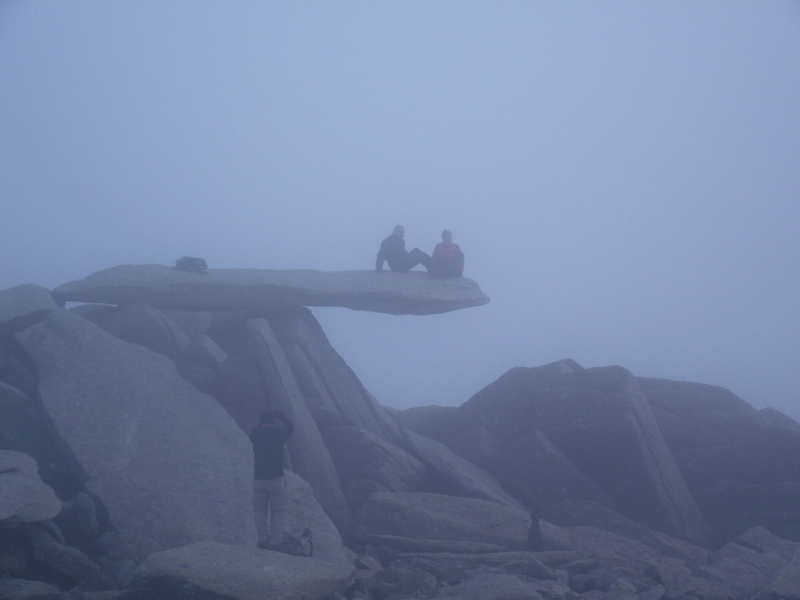 What a dramatic set of photos Paul – especially good with the misty conditions. Very envious of the brocken spectre. One or two of those pics made me feel a touch vertiginous – I’m obviously not cut out to be a mountaineer! I take it you need more than fleecy slippers and a bus pass to tackle the Seniors Ridge then? Seniors is a bit of a sheep in wolves clothing – there’s a path that weaves in and out of the rocky ridge, with just the occasional ‘hands on’ section – a bit like Striding Edge but without the drop. A great walk indeed SP – I’ve got a better pic of the Cantilever Stone somewhere, I’ll find some excuse to put it up on the web. You seem to have been missing for a while – you hadn’t fallen victim to that lock-out bug on WordPress had you? 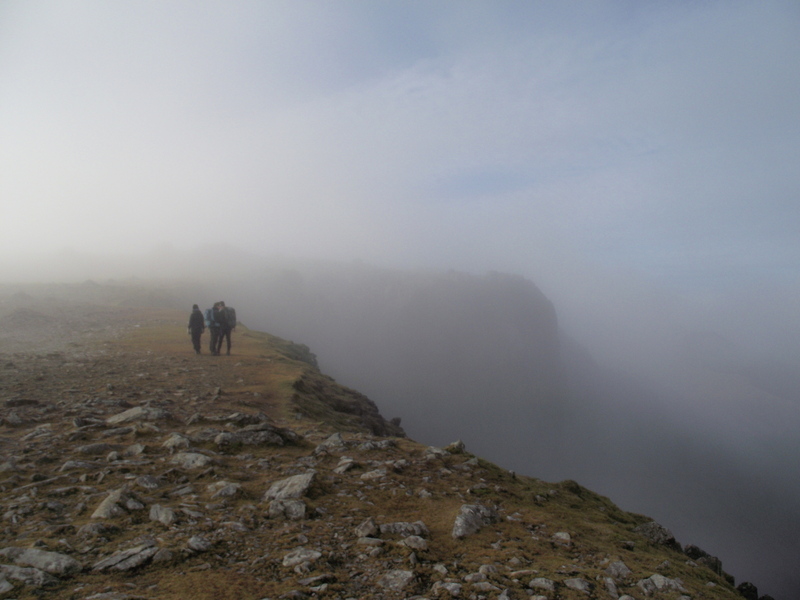 Like that photo of the walkers along the escarpment – really lovely. 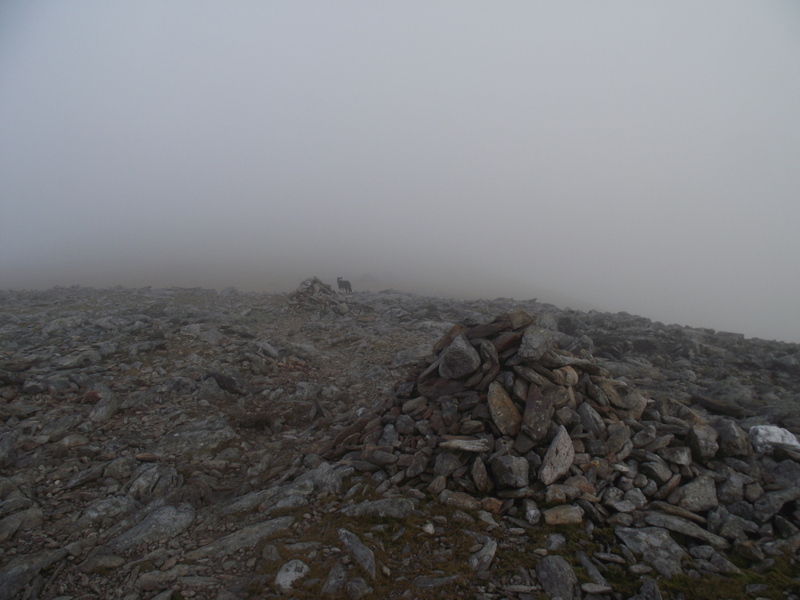 I did Y Gribin ridge once with Richard (going up which was easier) and had to get him to scout it out in a couple of places as I wasn’t all that confident at the time. I probably ought to go and have another look at it now. Also like the look of Seniors Ridge – didn’t know where that was before your post (although I’d heard of it). I wouldn’t mind a bash at Cneifion Arete if I had someone much more experienced and probably a rope to hand either. Hi Carol, and no I haven’t had any WordPress probs – I’m just blogging once every two weeks now, due to too many other things that I need to do. I’ve been down Y Gribin before , and didn’t remember any drama – I think it’s just me being over-protective of the dog, completely unnecessary really as she’s careful above drops. Seniors is a bit scrappy to make a satisfactory scramble, but it’s an easy way up new ground, and if you stick to the path it hardly warrants a Grade 1 – I bet it’s great under snow, and would make a safer alternative out of Cwm Cneifion if there was a chance of avalanche conditions. 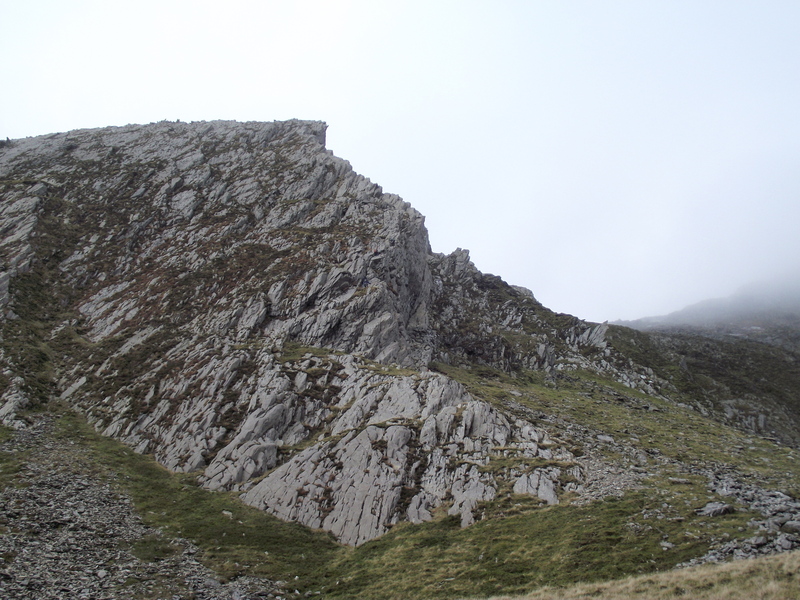 Cneifion Arete is a Grade 3 – you would definitely feel happier with a rope! It looks stunning from whatever angle you look at it. Watch this space – if there’s a nice warm day sometime next summer (haha…) I’ll be taking a trip there. I’ve never seen a Brocken spectre – lucky you and a great capture. 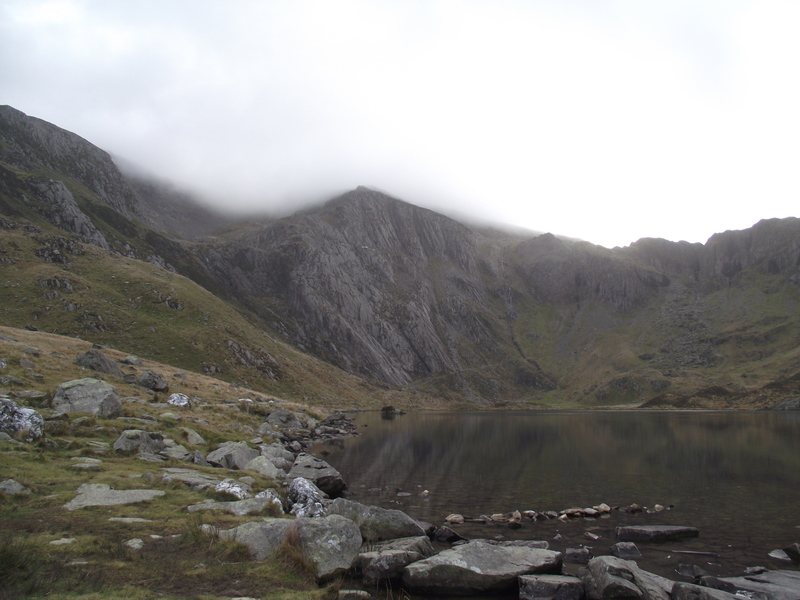 I’ve walked over the Glyders a few times usually after traversing Tryfan. I confess I’ve never head of Seniors Ridge. It’s only recently that I came across Seniors Ridge on someones website Andy – curiosity got the better of me, and it made an entertaining, if easy, day out. As I mentioned in the reply to Mountaincoward, I bet it would make a good trip under snow, and probably less of an avalanche problem.